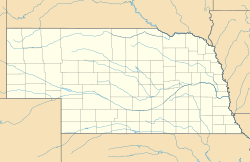 The Henry B. Neef House is located just north of the Minne Lusa neighborhood of North Omaha, Nebraska, United States. The Neef House was the first steel-frame house in the area, and was a pioneering construction style in Nebraska. It was built in 1929 by Henry Neef. The building was listed on the U.S. National Register of Historic Places on September 16, 2010. The listing was announced as the featured listing in the National Park Service's weekly list of September 24, 2010. ^ a b c "Announcements and actions on properties for the National Register of Historic Places for September 24, 2010". Weekly Listings. National Park Service. September 24, 2010. Retrieved 2010-09-27. ^ a b Nebraska SHPO staff, including Jessie Nunn (December 17, 2009). "National Register of Historic Places Registration: Henry B. Neef House" (PDF). National Park Service. Retrieved 2010-09-27. ^ "Weekly Highlight: Neef, Henry B., House, Douglas County, Nebraska". ^ "Weekly List Actions". National Park Service. Retrieved 2010-09-27. Wikimedia Commons has media related to Henry B. Neef House.